PCWin Note: .DBX to .PST 2.0 download version indexed from servers all over the world. There are inherent dangers in the use of any software available for download on the Internet. PCWin free download center makes no representations as to the content of .DBX to .PST version/build 2.0 is accurate, complete, virus free or do not infringe the rights of any third party. PCWin has not developed this software .DBX to .PST and in no way responsible for the use of the software and any damage done to your systems. You are solely responsible for adequate protection and backup of the data and equipment used in connection with using software .DBX to .PST. 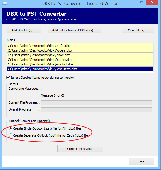 Outlook Express to PST Converter - Would you like to convert .dbx files to .pst? Then get Outlook Express to PST Converter that could swiftly convert .dbx files into .pst. It performs to convert OE to PST with original RTF (rich text formatting). Kernel Outlook Express - Email Recovery - Kernel for Outlook Express recover emails from deleted, damaged, corrupt mailbox files. It can successfully recovers mails from [Outlook Express 4.0 .MBX Files] and [Outlook Express 5.0 and Above .DBX Files]. Import vCards to Outlook - Import vCards to Outlook software easily export outlook contacts to vCards (.vcf) files and also import vCards (.vcf) files in Outlook. vCard Magic allows you to import multiple vCards (.vcf) files in Outlook contacts at a time. Import IMM Files to Outlook - Get the IMM to Outlook Converter that is appreciate solution to import IMM files to Outlook 2013, 2010 and other versions of Outlook. Add DBX file to Outlook Express - Import DBX files to Outlook Express, using the DBX to Outlook Express tool of PCVARE, when you receive "No messages can be found in this folder or another application is running" error during import operation in OE. DBX to PST Converter - Surely convert DBX files to PST with Outlook Express to PST Converter that quickly convert emails from DBX into PST. The tool is capable to convert DBX to PST of entire version- 2013, 2010, 2007, 2003 & 2000 etc. Open Outlook Express dbx in Outlook 2013 - Do you know about how to open Outlook Express DBX files in Outlook 2013? It's easy by using Outlook Express to Outlook Converter that could quickly import .dbx files into MS Outlook with all Meta properties. DBX Export to Outlook - The DBX Export to Outlook tool is faultless program to successfully export DBX files to Outlook within few minutes. The Software supports trial to know about How to use the DBX export to Outlook tool. Advanced Outlook Express Repair - Advanced Outlook Express Repair is a powerful tool to recover Outlook Express emails from corrupt dbx files and mbx files. It can scan the corrupt dbx files and recover emails in them as much as possible, so to minimize the loss in file corruption. Repair My PST - Repair My PST file software can easily fix corrupted or damaged PST file on all version of Windows operating system like Windows 7, Windows 8, Windows Vista, Windows XP, 2007, 2003 without giving any extra efforts.